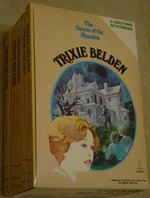 There are currently five Trixie Belden box sets in existence, released by Golden Books and Random House to promote the series. 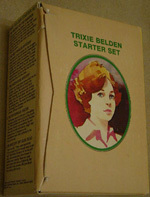 The Trixie Belden starter set was published in 1977 when Golden Books re-launched the series in the Oval paperback format. There were two sets released in a slightly different format. This box is completely enclosed, has a price of $4.75 on the cover and features first editions of all of the books. The books all have 75c printed on the cover. 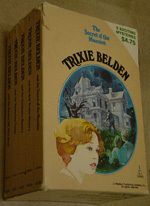 This set is only enclosed on three sides and the spines of the books are accessible on one side. There is no price on the box, but the books have $1.50 printed on each one and the spine number is followed by -22, making it a much later printing. 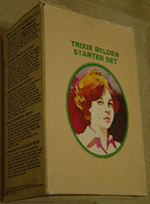 This set was released in 1977 or 1978 and introduced the first three new Trixie Belden books to be published by Golden Books. 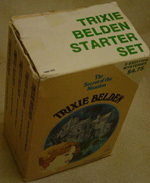 The back cover invites readers to join the Trixie Belden Mystery Fan Club, but current members were given offered the set at a special price in the 4th edition of the newsletter. View the offer. 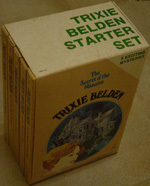 This set was probably released in 1979 or 1980 with second printings of books 24 and 25 and the Mystery Quiz Mini-book. 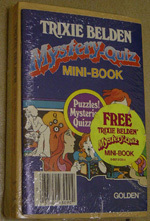 The Mini-book contained puzzles, mysteries and quizzes from both the Mystery Quiz books. 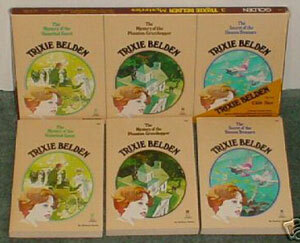 This box set includes books 29-31 and was probably released in 1979 or 1980. 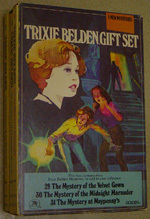 These three books were illustrated by Ben Otero, unlike the rest of the series and it's likely he also illustrated the box jacket. The box has one side open to reveal the spines. This version contains books with -22 suffix on the spine, but I've also seen an identical set that had a $3.75 price tag and the books had -1 suffixes. This set is to be published by Random House in September 2004. It's release price was US$20.97 and it contained the first three books of the series in the new Random House hardback edition.